Kofta, or kofte, exists in many forms and is found in many countries from the Middle East and North Africa, through Turkey and across to the Indian sub-continent. It can be flavoured and spiced in many different ways - in fact, the name just means 'minced', so there is not one standard recipe. The meat isn't always lamb, either - it can be beef or pork or a mixture. It can also be presented on skewers, as meatballs, or even as burgers. Peel and finely chop the onion. FInely chop the coriander. Mix the herbs and spice into the meat with the onion. Work it well with your hands so that you get a dense texture. Divide the mixture into equall sized balls, and flatten them with your hand. Heat some oil in a large frying pan on medium heat. Place the burgers in the pan and cook them for about 7 minutes on each side, turning once. When cooked, the internal temperature should be between 55°C and 60°C (131°F-140°F). Remove them from the pan and let them rest, tented in foil for about 5 minutes. Split your muffins or bread rolls in two and lightly toast them. Dribble some yoghurt and mint dressing on the bottom piece of bread. Scatter some lettuce over it, then add the burger, more yoghurt, a slice of tomato and the top piece of bread. The video above is from the Keef Cooks YouTube channel. 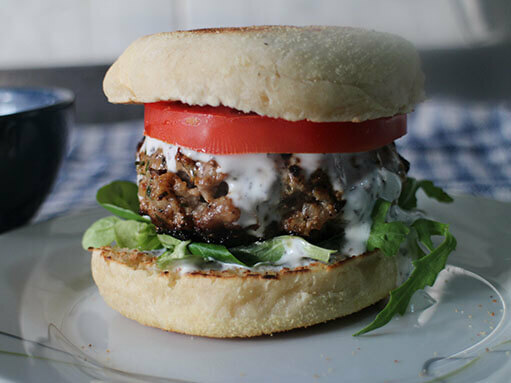 Click here to see the video recipe of Lamb Kofta Burger on YouTube. Oil for frying. The yoghurt dressing is simply plain yoghurt with a teaspoon of dried mint stirred into it.